16th June is a bank holiday in South Africa to commemorate the children who died or were injured on 16th June 1976. There was a peaceful protest by school children in Soweto who didn’t want to be taught in Afrikaans, partly because it was considered the language of the oppressing whites and because it would have meant they would have to learn Afrikaans and Biology in the same lesson! The education systems at that time meant that funds generated from taxes of blacks in the cities was being spent on education of people in the homelands rather than the cities. Also, the amount of money spent on education of black people was significantly less per child than per white child. While walking from their schools to the Orlando West Police Station to submit a petition against the teaching in Afrikaans, the children were met by police. The police tried to disperse them with tear gas as well as firing rubber and live bullets at the crowd. There is a famous picture of a boy being carried by a fellow boy after he was shot dead. The dead 13 year old boy was called Hector Pieterson and he is now often seen as the symbol of the uprising. In total around 700 children were killed that day and the days following it. 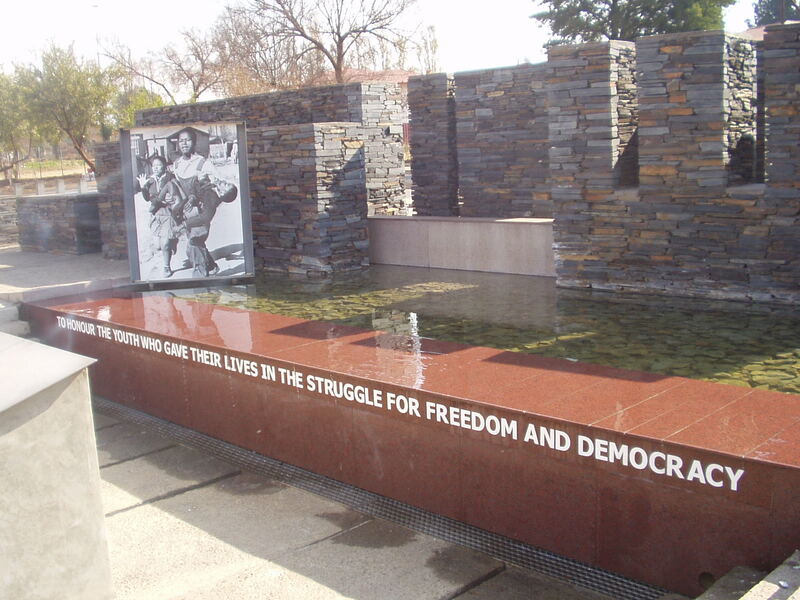 There is a museum commemorating the events of 16th June 1976, called the Hector Pieterson Museum. It has a lot of background on the events of 16th June 1976, with a brief history of Apartheid from the 1940’s as well as eyewitness accounts of what happened, transcripts from the subsequent investigations, and copies of the broadcasts made around the world just after the event. It is felt by many that the events of that day brought the plight of the blacks in South Africa at the time to a larger audience around the world and is one of the things that led to the subsequent international sanctions. The museum is at the cross roads where the first shots were fired and there is a memorial stone at the place where Hector died. As this is the 30th anniversary of the events, a second memorial site was unveiled on Friday which includes the statue of a child with a stone in its hand, as stones were all the children had to defend themselves against the bullets. On the Sunday, Kelly and I went on a guided tour of Soweto together with two Australians, Paul and Ricardo who happened to have booked a tour with the same company for the same day as us. Contrary to lots of people’s pre-conceptions, Soweto is not an enormous slum. There are some informal settlements, however a significant amount of the town (now part of the Johannesburg metro area) has brick houses. Many of the are very cramped and don’t have proper plumbing so have outhouses, and families have to live in two rooms (one of which is the kitchen). There are other areas referred to as middle class, with houses not dissimilar to those in other parts of Johannesburg as well as a reasonable upper class district where senior professionals, members of parliament and other wealthy people originating from Soweto live. We only drove past most of the houses, and Queen (our guide) explained the different styles of houses. The initial houses built were 4 roomed houses, a bedroom, a kitchen, a dining room and a sitting room, although the dining and sitting rooms often doubled up as sleeping quarters for family members. They have asbestos roofs and this is starting to cause health problems for some people and making subsequent alteration dangerous. Many people have been given the deeds for their houses nowadays, and many have extended their houses if they had the funds despite the asbestos dangers. There are also so-called Elephant Houses, which have a roof shaped like the back of an elephant. They consist of three housing units, on either end, two room units (kitchen and living/sleeping) and the middle one with three rooms. Again, some of these have been extended and some houses look a little odd as one or both of the end sections have been extended forward, the middle one hasn’t though or vice versa. We stopped at one of the informal settlements, and visited the house of a lady called Agnes. She has four children and they all live together in a small shack made of corrugated iron sheets. There is a small vegetable patch on which she grows some food. The settlement has been divided into plots, and strictly speaking, one family should have the use of a plot, allowing construction of a living shack and a vegetable patch. In practice, a number of people have allowed others to build on their plot to allow more people to have housing of sorts, which reduces the amount of space for growing food. Cat, who guided us in the settlement explained that he grows spinach and trades it for corn from others and it seems there is a barter system within the settlement. There also appears to be a quite a community spirit, with people helping out others. Agnes is a single mother and when she needs help with her shack, she can just ask others to come and help block holes in the roof or move the corrugated iron sheets if necessary. Similarly, people help each other if they need food or help with school fees. There is no running water or electricity in the informal settlements. The community has been able to get 300 chemical toilets, which are now placed along the thoroughfares and are emptied twice a week. There are also water spots, which are stand pipes that people can collect water from. The water is clean and can be drunk although there is only cold water available and people need to heat it themselves. Agnes has a coal stove in her shack, Cat explained that others have paraffin or gas stoves and there was a small shop by the water spot we visited which is a registered gas dealer. Some people have car batteries and use them to power radios or small black and white TVs. They can recharge them at petrol stations along the main road at the edge of the settlement. If someone has a TV, their house is usually full of friends and neighbours coming to watch, more so now that the football world cup is on! I had an overwhelming feeling that the people I met and those around them took pride in cleanliness and education. The area was very neat and each of the thoroughfares has a name and houses are all numbered. Most people accept that education is the best way to get the opportunity to move out of the settlement. Officially schooling is free, although in practice fees of R80 (about £8) are charged per child per annum and the children’s families need to pay for their books and school uniforms. This means that although there is recognition that education is a basic step towards improvement, not everyone can go to school. Overall Queen gave us the impression that there isn’t as high a level of crime in Soweto as people believe. Having driven around the middle and upper class areas, there are far fewer walls around the houses and there is no razor wire at the top of the alls and there are no guards. In fact, there were lots of children playing on front lawns and it felt like a nice suburban town. There are vigilante groups who work with the community and the police and in general fear of recriminations from vigilantes acts as a deterrent. It doesn’t mean that the actions of the vigilantes are always just though. The level of unemployment, especially at the informal settlements is very high. Cat’s only work is guiding tourists and he doesn’t do it every day, taking turns with others. In formally settled areas, we saw a number of car washes which appear to be run by children and Queen explained these children wanted something to do and didn’t want to turn to crime, so started hand car-washes. In some families, these children are the main breadwinners supplementing the food grown and bartered for. For lunch we went to Wandies which is an African restaurant where we had lovely stew with maize meal. The food was great and it is clearly a place where lots of visitors to Soweto go for food. Most of the tables were like ours, one black person and a group of white people. We visited the Hector Pieterson museum as well as the house that Winnie and Nelson Mandela had lived in with their daughters before he was sent to jail. Winnie and the daughters stayed there for the 27 years Nelson Mandela was imprisoned. He returned to that house for 11 days on his release, but didn’t get any privacy there as so many well wishers wanted to meet him. It is now a museum about him and his achievements. The house is one of the original 4 room houses and it was interesting to go inside it and get a sense of the space (or lack of!) that so many people in Soweto live in. 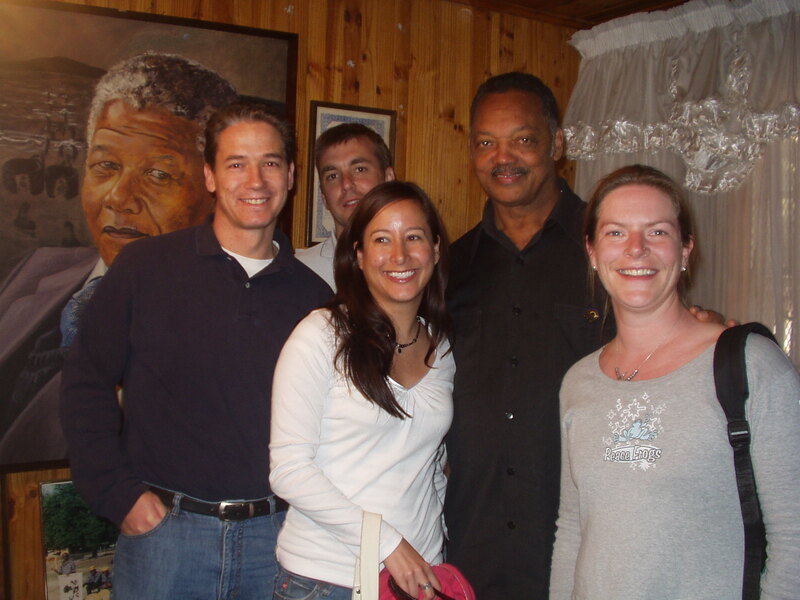 Just as we were leaving the museum, a group of people arrived, including Jesse Jackson. We went back and he kindly agreed to have his picture taken with us. For those of you who haven’t kept up with my celebrity spotting on my travels, I sat 3 seats away from Prince Harry on one of my flights out here, saw Snoop Dog in the departure lounge in Jo’urg and saw Bono walk through Business Class to First class on another flight. Jesse Jackson is therefore only the last in a row of celebs I’ve seen out here. Soweto also has the largest hospitals in the southern hemisphere. Queen rattled off some impressive statistics of number of beds, doctors and nurses, the only one I can remember is that 24,000 children are born at its maternity unit each year. It’s opposite a large taxi rank which also acts as a market place. The taxis around here appear more like an unscheduled bus service to me. Hand signals are used by potential passengers standing at major road junctions to indicate where they want to go as the taxis go past. Pointing your index finger up means you want to go up to the city of Johannesburg, an O shaped with your thumb and index finger means you want to go to Orlando. The taxis are minivans and the drivers beep their horns to indicate that they have space and will also use the same hand signals to indicate where they are going. These taxis are all over Jo’burg and while driving you need to keep an eye on them a bit as they will pull in, out and over at any time. Many are also not considered roadworthy and they are referred to as coffins on wheels by some people. A re-licensing and recapitalisation project is underway at the moment to improve quality of drivers and vehicles across the country.